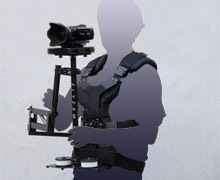 An excerpt of our ever growing Gear-List! The new Canon C100 resembles a small form-factor great images due to a Super35 FullHD image sensor with 4K Bayer-Pattern and an EF/EF-S Lens mount! 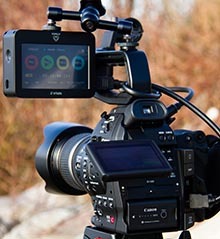 In conjunction with the Ninja2 recorder it delivers great image quality even for the big screen! See examples and read our Review. Portable Field Recorder from Atomos with ProRes LT 8bit 100mbit, ProRes 10bit 4:2:2 150mbit, ProRes HQ 10bit with 220mbit and Avid DNxHD Broadcast codecs! Versatile, small and reliable with great features and best companion with the new Super35 Digital Cinema Camera Canon EOS-C100! 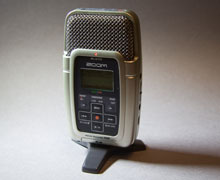 More details about the recorder in our Review. Records QT Movies in AVCHD h.264 codec with apx. 40MBit in 24/25/30fps @ 1080p and 50/60fps @ 720p. Very Film-like look with various Picture Styles! 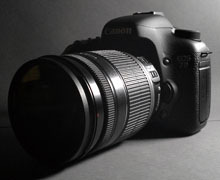 With various lenses for the needed image (Canon EF-S 17-55 f2.8, EF 50 f1.4), Pentacon M42 135mm f2.8 and others. 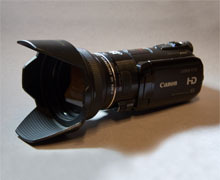 1080p 25p HiDef 24MBit AVCHD Camera with 32GB Flash Memory. Very light sensitive and Film-like look in 25P Cinema mode and even with our new Atomos Ninja 2 with up to 220mbit (ProRes)! 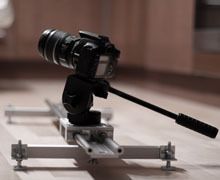 Low Angle Micro Dolly with Handle for steering. 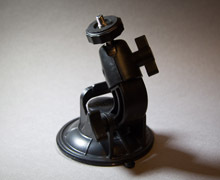 Read the Article about the LRD and it’s making. 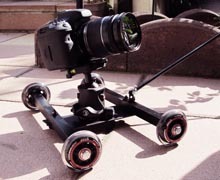 Our Slider Dolly with custom legs and motorization for many kinds of dolly drives and timelapse shots. 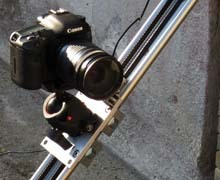 Watch our movie TRAINS or the WORKSTATION movie to see the Slider in action. 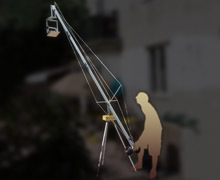 A very lightweight jib for filming in smaller locations and rooms with adjustable length and very easy operatable. 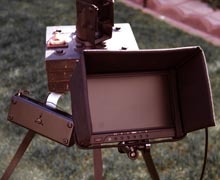 Spoof commercial Black Ops Mission Tablet – a short movie we shot with the ÂµJib and the LowRiderDolly. 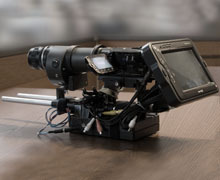 We built our own Camera Crane with remote controlable Camera Head. 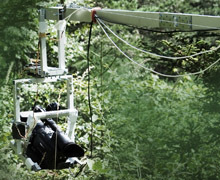 The jib is 4 meters long and with our custom made tripod it can reach a height of over 4 meters. 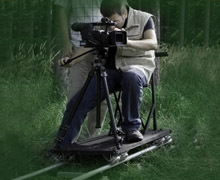 With our light-weight Steadycam we are able to shoot smooth and steady shots even while running with the Camera. 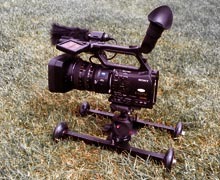 The easy axpandable Dolly with aluminium Tracks built by NTown makes it possible to shoot amazing slow and steady camera drives! 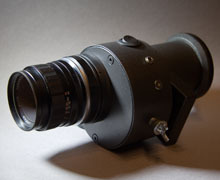 For nice Cinematic shots we use the Modo35 DoF Adapter for small sensor cameras. 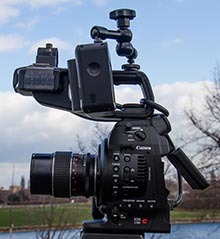 With our Rod-System mounted on a Walser-Tripod and attached to the Canon HFS-10 we can use a range of 35mm M42 Lenses to achieve the best cinematic look. Walimex LED500, Walimex LED60, Walimex Daylight600, etc. 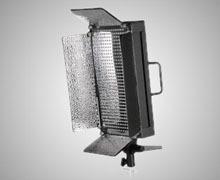 To brighten up our movie scenes we use our Walimex Led Arrays or the bright Walimex Pro Daylight with 5400-6500K color temperature. 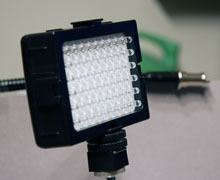 For indoor shots we either use our daylights with incandescence filters or some of our Halogen Lamps. 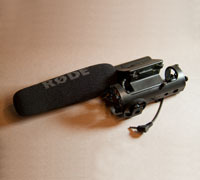 Capture the sound in its most nature form is the strength of the H2 field recorder, in addition using the right mike for specific uses with our Shotgun Rode NTG-2, Rode Lavalier, Rode Videomic or the superb internal 4-channel mike from the Zoom-H2! Recording Foley Sound Effects, Dialog and Athmo Sound even in 4 Channel Surround as 24bit 96khz high quality WAVs for easy editing. 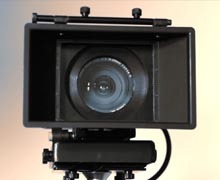 We dont want to count every small piece of equipment here but certenly there is some more stuff like tripods, stands, filters, supports, cases, screws and whatever is technically needed to round up a successfull production. 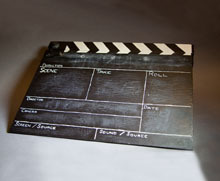 We even got a nice NTown custom-made Film-Slate! For movie editing, sound editing and special visual effects work a reliable and powerfull workstation is must. 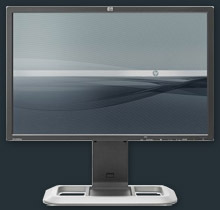 Every system has it’s pro and cons, I choose a Windows PC System with handselected components.